The Browns had given up hope. A policeman brought a telegram early in the morning notifying them that their son was missing, but no other information. Later that day, at about 5 p.m., a news wire reporter called them by phone to say George had been confirm as a survivor. Only two injured survivors were evacuated from the Swiss rescue ship Celerina to the Bonaventure while the storm continued to rage around them. The other injured passenger was Mrs. Lois Elander. Both were treated in the air craft carrier’s sick bay. The other survivors remained on the Celerina until the weather cleared. 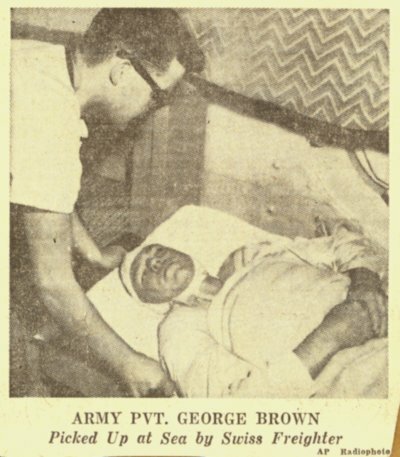 The following day, senior Brown told the Oshkosh news that his son spoke to them by phone only a few days before the ditching. He was still in the states. He told them that he was going to Europe by ship. “It came as a surprise when we learned they had flown him over,” he said. Stars and Stripes reporter Peter Foley captured a glimpse of Pvt. 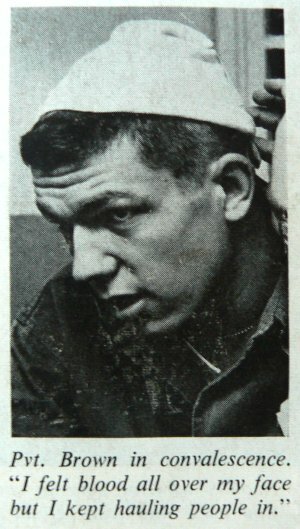 Brown in his story in the Saturday Evening Post in October 1962. His story spanned four pages of the magazine and included a number of comments on survivors. This entry was posted in new combat troopers and tagged Flying Tiger, George Brown, liferaft, Oshkosh, survivor. Bookmark the permalink.